OPTIZMO™ provides users with an easy way to upload campaign creative assets into SUPPRESS and auto-embed unique Opt-Out links to track unsubscribes specific to the creative used in any given campaign. Our Creative Distribution feature distributes creative alongside your Opt-Out lists to your mailers. 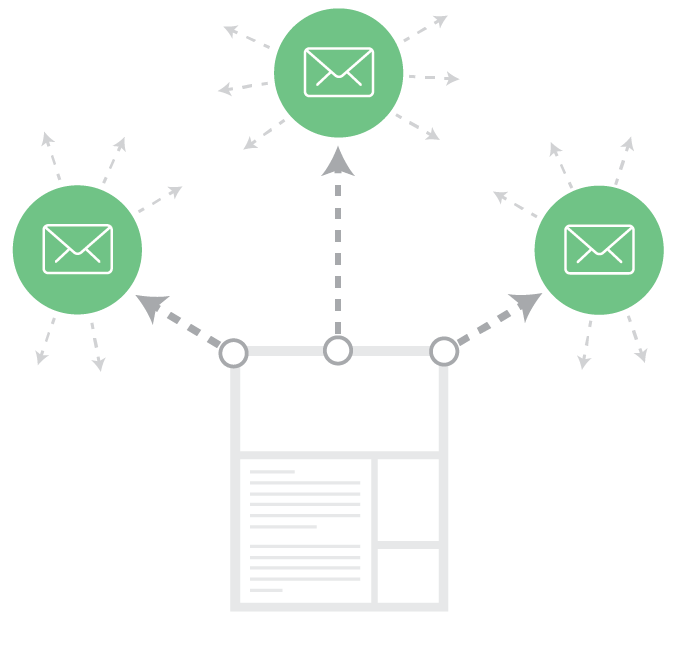 OPTIZMO allows Email Advertisers and Affiliate Networks the ability to upload email campaign creative (email copy, graphics, subject lines, etc.) into the OPTIZMO platform prior to sending it out for internal compliance checks and to auto-embed unique Opt-Out links. Creative Distribution also provides the ability to receive the post-send creative back from the recipient to identify any potential changes made by Mailers and sub-Mailers. If you are working with a large number of mailers, you have a number of different approved email creatives, or you change approved creative multiple times over the course of a campaign, you know how challenging this process can be for your team to manage manually. You may need to contact each mailer individually with the details and you likely have limited ability to track whether approved creative is being used every time an email is sent. Creative Distribution Manager takes over this manual process, delivering time savings, fewer chances for errors, and transparency into how mailers are accessing your approved creatives. Clients can easily distribute approved campaign creatives to mailers along with Mailer Access Keys, Suppression Lists, and Opt-Out Links. Easily provide your mailers with access to one or many campaign creatives for a campaign in HTML, Plain text, and image formats. Include additional details like approved From Addresses and Subject Lines or HTML Variables to support tracking. Use placeholders to customize Opt-Out URLs and Opt-out Link text (Mailer ID). Creative information is easily available to mailers on the same page they use to access the campaign’s suppression files and Opt-Out lists. 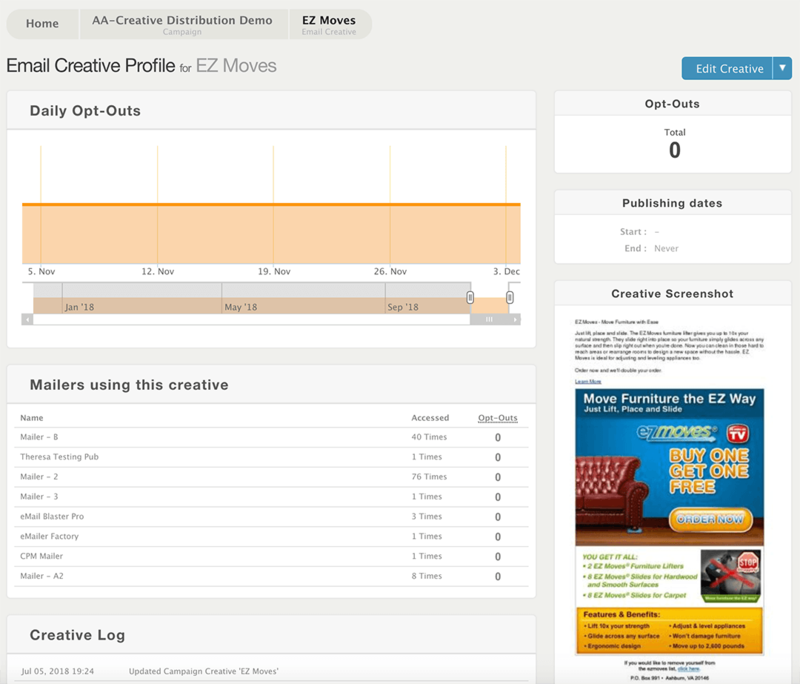 Creative Distribution Manager also provides insights and analytics to help you track creative usage and the number of Opt-Outs generated by individual creatives. OPTIZMO clients are all unique, with their own needs from a suppression list management solution. With that in mind, we have created different types of accounts to best serve our clients’ needs. OPTIZMO will be at LeadsCon Las Vegas from March 4-6, and we’d love to meet you.